OuttaBounds Hawaii is a private / custom guided bicycle tour service. This is geared towards athletes looking to explore Oahu on two-wheels. These rides can be customized to focus on distance, speed, hills, site-seeing, etc. Route will be determined depending on desired ride type. Rate is for 1-4 riders. $110 includes first two hours of riding. Additional hours are $50/hour and can be added before or during the ride. Rate does not include bike rentals, but are available for additional charge. OuttaBounds Hawaii is a service provided in partnership with Bikeadelic Hawaii. The rides will start and finish at Bikeadelic, unless otherwise arranged. Bicycle rentals can be arranged through Bikeadelic. This is a custom tour and is tailored to the desires of the rider/riders. Want to ride around the whole island? We can do that. Want to go check out the scenic coastline past Hanauma Bay? No problem. 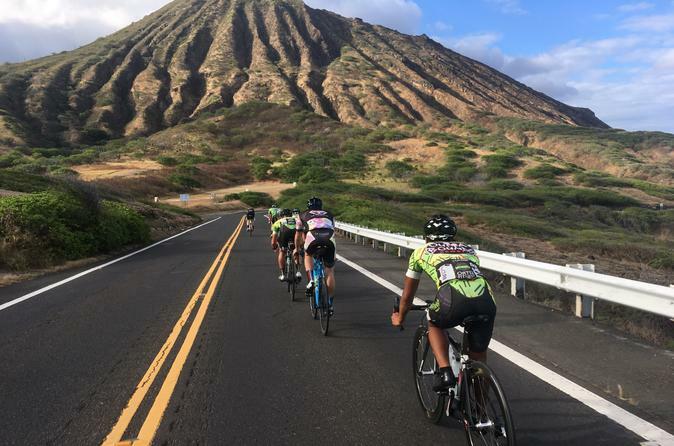 Looking to climb the most challenging climbs on Oahu or go ride an abandoned highway? We can help with that. These tours can be challenging or aimed at more fitness minded site-seeing. You determine the focus, we'll lead the way. Rate is $110 for first two hours, then $50/hour after that. This rate is for 1-4 people. Larger groups will need second guide and will be charged the same rate for second guide. Feel free to ask questions before booking. This is very customizable!